Although predominantly known for its hi-fi gear, Meridian has also been a keen supporter of multichannel audio. So when the call came to see if I'd like to witness its new home cinema demo room, I was halfway up the M11 before I'd put the phone down. My visit kicked off with a tour of the production plant in the company of Barry Sheldrick, Meridian's Director of Sales. There was an assumption on my part that this would be pretty much identical to other such installations I've nosed around, but there proved to be some intriguing differences. Meridian uses the same processes, staff and equipment to make everything, rather than breaking it down into specialist groups. This actually gives it impressive flexibility in dealing with orders. All final assembly of Meridian gear takes place in the Huntingdon HQ, and this has resulted in the need for clever use of resources and time. When assembling a £15,000 Ultra DAC, for example, the costs of building in the UK are fairly easy to absorb, but when dealing with the £200 Explorer 2 DAC and headphone amp, the challenges are rather greater, so Meridian has developed a process where five Explorer boards are populated as a single unit, before being sliced into sections and inserted into the chassis. It's a clever workaround which considerably reduces production time. It also becomes clear, amidst the high-tech machinery and stark white décor, that Meridian's test procedures are diligent to the point of obsessive. Whenever a major production process is finished, the product is checked thoroughly. Having completed assembly, everything settles down for a lengthy soak test – where it is left performing one or more functions for an extended period. By the time you unbox a Meridian component for the first time, it's been through some rigorous procedures. A healthy selection of these products are on display in the all-new cinema room. What isn't present, however, is a Meridian projector, which may come as a surprise for those who remember the brand leading the 4K PJ charge a few years back with its 810 Reference Video Projector. Sheldrick explains that Meridian has taken the decision to move back from areas with a high rate of 'churn' and development (certainly a charge that can be levelled at the video world), and this means image duties in its demo suite are left to other brands (Barco and Kaleidescape). 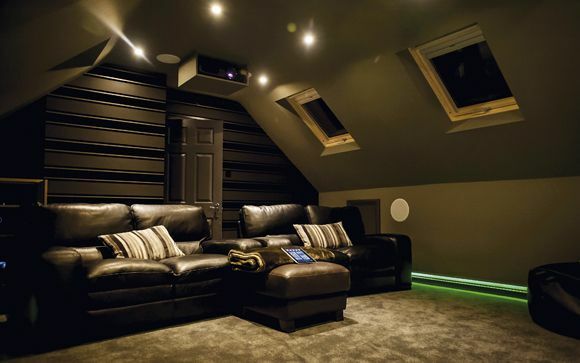 In fact, Meridian and Barco's residential division have now inked a deal whereby the latter's high-end PJs will join the former's audio kit in Meridian's home cinema design and specification service. The cinema uses a medley of the company's active speakers. Meridian is one of the best known producers of actives. and its strikingly shaped designs are coolly sophisticated. The theory behind such speakers in a home cinema system is entirely sound, and results in a kit rack that's extremely compact, with an 861v8 Surround Controller and an HD621 HDMI interface. There's no need for the customary wall of power amps as everything is built into the speakers themselves. Of course, if you want to use power amps, the system is able to mix and match passive channels. As a Meridian setup is more like a network than a conventional hookup, it is impressively customisable. If you need more oomph from your centre channel, for example, it's no trouble to run two centre channels in parallel. The speakers are 'aware' of each other and can be set to work together rather than simply doubling up and hoping for the best. Technologies like the company's Enhanced Bass Alignment (EBA) ensure that multiple speakers behave like a single unit, and that output reaches you as a single, cohesive signal. This flexibility also means that Meridian systems can grow and adapt to your requirements. It hopes to offer impressive longevity in an industry where products can be current for a painfully short length of time. As the 'v8' part of the 861's product title suggests, Meridian has regularly updated its AV processor. The HD621, designed to strip PCM from HDMI for the 861 to process, has been around since 2008, which is an epoch in HDMI terms. However, it is due for replacement in 2017, as Meridian moves forward with plans for new solutions with HDMI 2.0 and Dolby Atmos support (the new demo room is already running height speakers in a 7.4.4 config, using DSP320 in-ceiling/in-wall models). You'll be wanting to know what it sounds like. Settle down in one of those smart-looking chairs (they're actually from the Range Rover Evoques that were modified for use in James Bond flick Spectre...) and prepare to be seriously impressed. And you don't sit there listening for the clever technology, or the fact that the system is active, or even that behind the screen sit three whopping DSP8000 flagship speakers that manage to look stunning and borderline menacing at the same time. Instead you concentrate on the performance. I say 'concentrate' but in reality, for the first few minutes at least, you'll likely be slack-jawed in astonishment that any system developed for domestic use can have the reserves of power and sheer impact that this one does. An excerpt of Muse's live concert DVD is an object lesson in placement, tonality and integration. The music arrives at the listening position with no need for the brain to put thought into it sees and hears. The two match perfectly. Switching to film, I spun up my stock test piece – the helicopter winching sequence in Unstoppable. I've heard this hundreds of times, and I've never heard anything like what this system does. The weight of the locomotives is tangible but at the same time every fine detail in this dense mix is there for your appreciation. This is equipment that effortlessly blurs the boundaries between home and professional use. I could have spent hours flicking through the films on offer... but there was one final facet of Meridian's activities to see. The MQA (Master Quality Authenticated) audio format is a big buzz in hi-fi. While developed by Meridian founder Bob Stuart and supported on a number of Meridian products, MQA is a separate entity, dealing with numerous brands, including Pioneer, Onkyo and Tidal. It therefore has to operate at arm's length, so to meet Stuart I had to trek out of Meridian's space in the building and into MQA's. The tech allows for a high-res, studio master-quality audio file to be transmitted in a more compressed condition than is the case for existing high-res rivals. The benefits of this are obvious – more music housed on a portable media player, improved quality of streaming platforms. And perhaps crucially for the prospects of weary veterans adopting another format, MQA has been designed to work at two levels. If you have a standard DAC or streamer, an MQA file will play without the additional information added to the signal. If you have an MQA decoder, it will process the extra info for better quality. It's hard not to be won over by Stuart's passion for MQA as a concept. And as far as he and his team are concerned, this is more than a method of beefing up quality. MQA is being mooted as a means of correcting errors in encoding and mastering that have affected recordings from the outset of digital. I had demos in the cosy confines of the MQA test room, and sample material (including Steely Dan's Babylon Sisters) managed to sound exceptionally good, and crucially avoided that overtly 'digital' feeling that can bedevil high-res formats. And there was an interesting hint for the future. At the moment, MQA is focused on two-channel audio but it was suggested that, as and when the company has the time and resources to do so, it could make a play for the multichannel world, too, supplying higher-quality sonics to on-demand video services. I'll be all ears.